What is it about the wolf that is so handsome? Is it the dogs I’ve known and loved over the decades that I see in the wolf? Perhaps. Still, I seem to recall in foggy memories of my early childhood past, a short-lived fear of the wolf. Was it one of those fairy tales with scary wolves that caused those distant fears? Yes. Of course. But then I came to understand the wolf more, and enjoyed the companionship of goodly dogs. The wolf became wonderful to me. 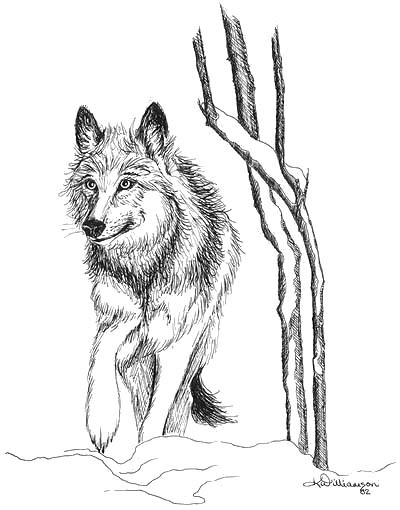 A number of years ago, I saw one quite thin lone wolf trotting along the road near our home here. I felt sad for him. I worried that he might starve. It was winter and he looked hungry. Why was he alone? How could he hunt alone? I wanted him to find his family pack. Wolves seem meant for that. They are social creatures. Like dogs, they need their family. I found your blog through Chiara Petro’s blog and your drawings are amazing. I am a parchment teacher and Chiara is one of my parchment students and I like to do these drawings on parchment with paint or pencils. Am I allowed to use your drawings and show them to you?? Sorry it took me so long to respond to your comment – it’s been a busy summer. Thanks for the compliment! I don’t know exactly what you mean about using my drawings for parchment (paper?). My art and writing falls under copyright laws, but feel free to find any of your own personal inspiration therein. If you are simply painting or penciling your own versions inspired by my works, that sounds fine to me. Such talent…you are truly gifted!